Last Saturday was our Bridal Flower Open Day which was attended by in excess of 50 Brides / Grooms and their families. We were inundated with enquiries and now have a busy few weeks compiling quotes and meeting with couples who booked appointments for consultations with us. It was lovely to see so many people and we were also delighted to be joined by local companies Eliza Mabel, Queen Bees Treats, Carro’s Cakes, Hana Venn Photography and Quaint and Quirky Event Hire who all loved being part of the day. 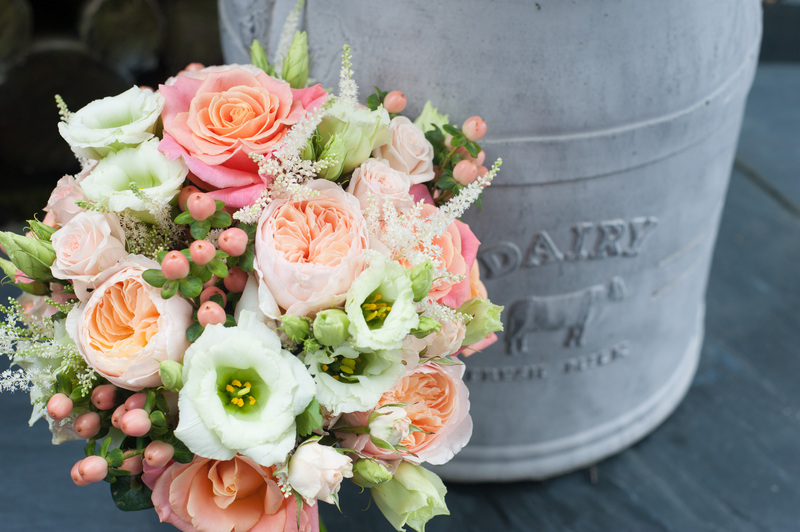 Our Bridal Flower Open Days are a great opportunity to view an extensive range of Bridal Party and Venue Arrangements and a wide range of cut flowers suitable for weddings. Feedback from those who attended was that it is so useful to be able to see flowers ‘in the flesh’ so to speak and to be able to look at and hold bouquets of differing sizes and shapes. We are grateful to all those who attended the Open Day but if you were unable to make it, our next one will take place on Saturday 28th March 2015. One Weekend – Ten Weddings! As we draw breath from an extremely busy weekend in which we supplied flowers to 10 weddings and prepare ourselves for another busy week just a few photographs which we thought we would share with you. Starting with some of the bouquets – all in varying colours which proves we can supply flowers to suit all colour schemes and themes.